Just as the horizon was turning pink and the city was awakening to the hustle and bustle of capitalism’s business-as-usual, a banner appeared in the most unlikely of places – hanging from the rooftop of the city’s Old Municipal Court Building downtown. 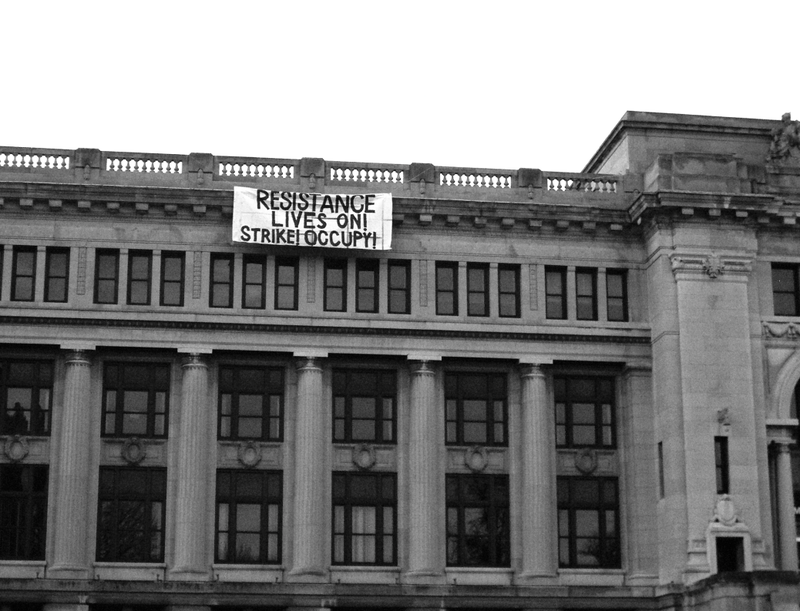 The building, which on November 17th hosted an occupation and joyous dance party, had been subject to the police and city’s greatest efforts of “investigation” and “securing the building”. But apparently they had not counted on the tenacity of those whose joy and adventurousness cannot be contained by the drudgery of life under this system. The banner, which hung throughout the morning proclaiming “Resistance lives on! Strike! Occupy!” was testimony to the fact that despite their best efforts, we are ungovernable.